Most mothers vividly remember holding their new bundle of joy in their arms for the first time and looking into those eyes as that little mouth latched onto the source of food and life itself–MOM. Midwives urge mothers to begin to nurse as soon as possible after birth in order to strengthen the bond between mother and baby. The food we give not only sustains life, but also helps mother and baby to fall in love with each other. But mothering involves much more than feeding our children’s physical bodies–it also involves feeding their little hearts and souls. And what do hearts and souls need to thrive? Goodness, of course, and what better way to feed goodness than by reading a good book. Just as feeding our children’s bodies builds a bond between mother and child, so does feeding their souls–it is a way of connecting heart to heart. As world literacy expert, Mem Fox, says, “the fire of literacy is created by the emotional sparks between a child, a book, and the person reading–not the book alone.” When I talk to children about stories, I will often liken them to journeys, and just as journeys involve a movement from one place to another, so too does a story also involve a movement–a movement of the heart to feel something–the word emotion means a movement from the heart. When we read books that we love to our children, then we will naturally breathe our own life and love, spirit and soul into those words as we read aloud. In turn those words will seep into our little listeners’ souls–a meeting of hearts. 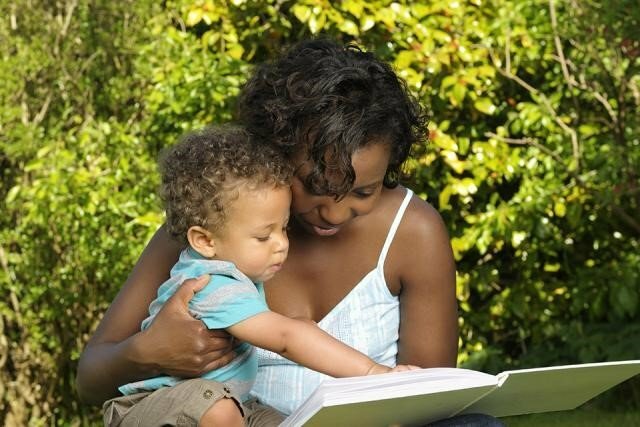 So what “emotional sparks” shower mother and child when they share a good book? After over 20 years of reading aloud at an inner city school to children from Kindergarten to 7th grade, and after a life time of savoring good books that stir my soul and make my heart sing, here are some of my favorite “emotional sparks,” some threads of goodness that tie mother and child closer together.